My father, was one of those “Jack of ALL Trades” kind of guys. He decided that the flat portion of our back yard would be perfect for an outdoor rink and he made it happen. We had nets and everything, the snow we shoveled off the ice surface would be our “boards”. When my dad taught me to skate the winter of 1973, he couldn’t find skates small enough-so being the guy he was, he took a piece of sheet metal, cut it to fit my baby shoes and bent it into a U-shape, effectively making me little double runner skates. We would put the metal dining room chair on the ice for me to hold onto like a walker and off I’d go. I’d throw fits every time it was time to go in. I never wanted to stop. With my love of the Broad Street Bullies, I even remember them getting the Stanley Cup in 74 though I was just about 2 years old. I decided then and there that I was going to be a hockey player. In next year or two I spent my winters playing “hockey” with my older brother on the rink in our back yard. I remember watching the captivating Dorothy Hamill in the 1976 Olympics and thought while it was pretty, I still wanted to be a hockey player, not a figure skater. Thus ended my dreams (at least temporarily) of being the next Bobby Clarke. Though Title 9 was passed in 1972 giving girls the right to play on boys teams…my dream of playing hockey would have to wait. I took off in figure skating. I did rather well. As I got older, I was a very fast skater, by 6th grade I could out-skate the high school girls–mostly because when I skated fast I still skated like a hockey player. It wasn’t until after I graduated high school that dad’s mind began to change. Hockey teams with names like “Chicks with Sticks” started. In 1992, the Tampa Bay Lightning signed Manon Rhéaume to a contract. While she only played preseason…it was a turning point…then that summer A League of Their Own was released…and my life changed. 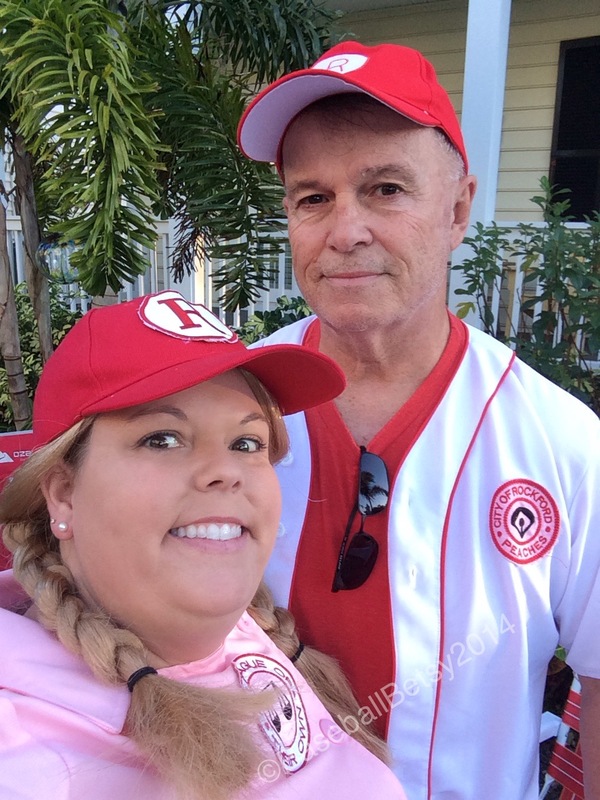 I argued that if women could play PROFESSIONAL baseball, why couldn’t I play hockey? All of this leads up to Saturday of this week. I was watching the GCL Phillies take on the GCL Blue Jays at the Carpenter Complex. The umpire was a woman…it wasn’t the first time a woman had umpired a GCL game, last season Jen Pawol had done it, but this was another woman…that meant it is for real, it wasn’t just a “one-off”. I had the lucky instance to be able to talk to Darren Spagnardi, who is one of the Field Evaluator/Instructor, Umpire Development personnel for MiLB. As we talked, he said that Jen Pawol has been moved up to the New York-Penn league and that Emma Charlesworth-Sellers had graduated umpire school this year. He was also proud to say that there is already another woman signed up for next year’s schoo! They are actively recruiting woman for umpiring from both softball and baseball as it can be a continuation of their sports careers. The thing that stuck with me the most was that he had said that there is none of the “macho” baloney, none of that “you’re a woman, what are you doing here” kind of attitudes, that female umpires have been actively, fully and completely integrated without any sort of backlash. He said they are fully accepted as any other umpire. The times are changing and I love it. Women’s Sports Hall of Fame Coming to Sarasota! I really enjoyed the story from our local news today, the Women’s Sports Hall of Fame is coming to Sarasota! The highlight is members of the All American Girls Professional Baseball League singing the theme song of the league. 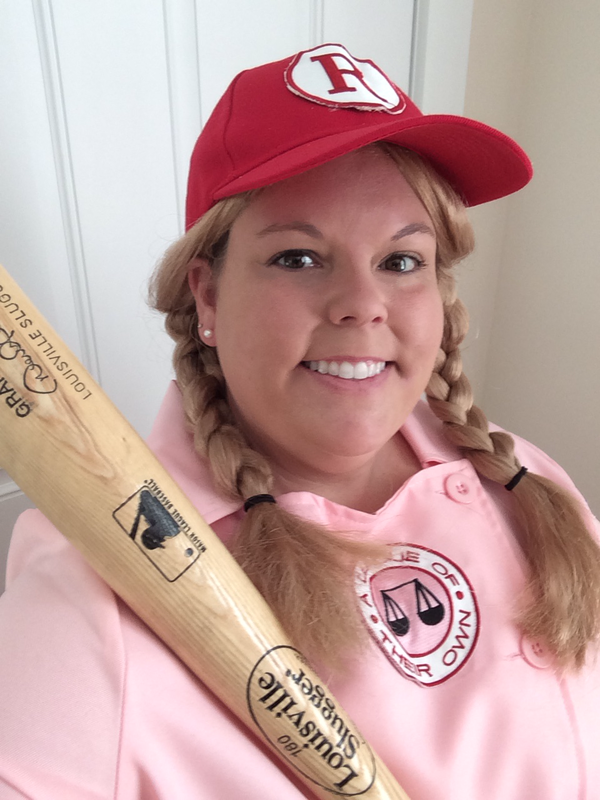 If you’ve been reading my blog for any length of time, you’ll know how much I love AAGPBL. 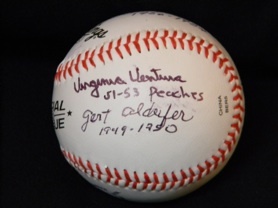 Recently, I wrote how the AAGPBL museum is moving from California to just across the street from historic Beyer Field where the Rockford Peaches once played in Rockford, Illinois. You can read that article HERE. 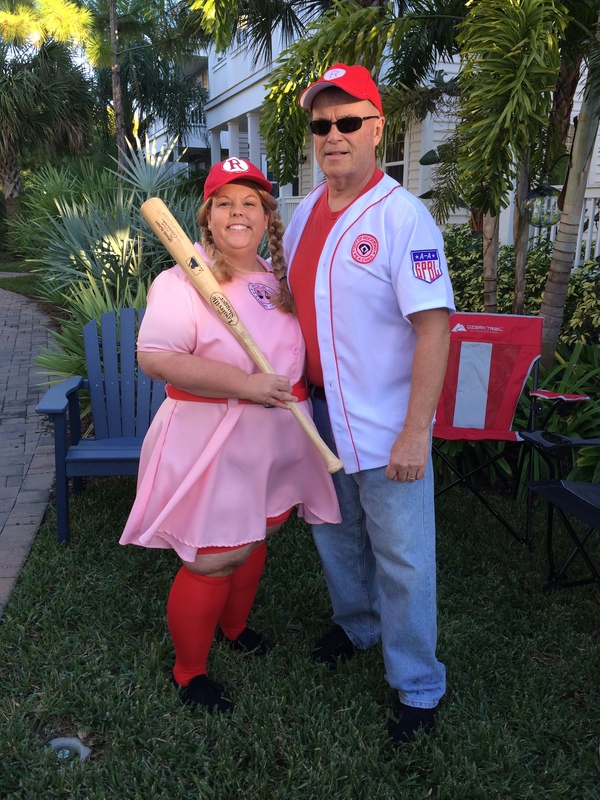 Over the years, I’ve gotten to meet many of the girls and even donned a Peaches costume for Halloween you can read at about me meeting several players and the costumes HERE. That being said, when the museum finally opens, I’ll be at the front of the line, with my money in hand to see some memorabilia of my heroes, the girls of the All American Girls Professional Baseball League! One of my favorite things about baseball is a part that is often forgotten. The All American Girls Professional Baseball League. At a time when most women got married before they turned 20 and stayed home to raise the children, these women were part of a change that is still felt today. I can’t tell you how that movie changed my life. I had been raised with traditional values. I remember seeing the “Broad Street Bullies” Flyers of the early 70’s and telling my father that I wanted to play hockey to which he replied, “You are a girl, you will figure skate, that’s what girls do.” It took me more than 15 years to get my father to allow me to play on his non-contact hockey team and the ALOTO movie was a big part of that. I have been rather obsessed with the AAGPBL since then, I’m working my way through THREE different books on the league. In many ways, Rosie the Riveter and the AAGPBL did for women what Jackie Robinson did for people of color. I was lucky enough to meet several of the players in Reading, you can read the blog HERE. 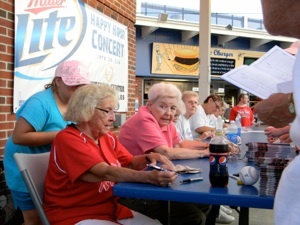 On August 8, the Winnebago County Officials and the Park District (where Beyer Stadium of the Rockford Peaches was located) announced that the International Women’s Baseball Center would be moving the center from California to a location directly across the street from where Beyer Stadium once stood. The official announcement will be make at There will be training and educational facilities as well as a museum dedicated to girls’ and women’s baseball. You can read the new statement on the IWBC’s announcement on their site HERE. I am beyond excited! In June, I very nearly drove the five hours from my aunt’s house to Rockford just to see the commemorative plaque at Beyer Stadium. The stadium was torn down in the early 1990’s and recently, the Friends of Beyer Stadium have worked hard to build a new baseball field on the site as well as dugouts and a beautiful fence. They are working hard to help future generations remember the importance of AAGPBL! You can read more and see many pictures of the hard work they have done on their Facebook page HERE. I can promise you that when the new museum opens, I will be there! I have to, I mean where else can I see the Peaches’ bus? 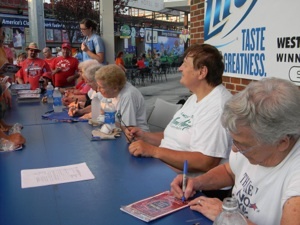 If you read my blog back in 2011, you would have read a story I did on meeting some of my heroes, the women of the All American Girls Professional Baseball League. This all-female baseball league founded in 1943 by Phillip Wrigley of Wrigley Field/Cubs fame and Wrigley gum, took the place of Major League Baseball while most of the men were off fighting World War II. It went from 1943 until 1954. The league was featured in the movie, “A League of Their Own”. I had the extreme privilege of meeting several of the women who played back then including Ruth Kramer Hartman, the Queen of Baseballtown aka the Reading Phillies. These women were always my heroes as they did exactly what boys could do. As a little girl, I thought that it was amazing that “girls” could play professional sports. Just in case you missed it, here is a portion of the article from 2011 and the link to the full article on BaseballBesty.com follows. Before the movie, “A League of Their Own” few people born after the 1950’s knew of the women of the All American Girls Professional Baseball League. Phillip K. Wrigley, of Wrigley Gum and Chicago Cubs fame, wanted to keep baseball in the public eye during World War II, when most able-bodied men were away fighting. These woman played professional sport at a time when most women would be expected to stay home, have babies and keep house; MAY BE have a job such as a secretary, but professional sports? It was unheard of. They likely didn’t know it at the time, but they started to break down the barriers, break the stereotypes that allow women to do what ever they want to do today. Along this line, other than the fact that I, myself appreciate this, what stood out to me, was the little girl in the teal shirt in the first photo above. She was so excited to meet these ladies, she asked to have her picture taken with each and every one of them. For any other little girl, you might have thought that there were six Justin Beibers up there signing autographs. She was nearly in tears to see these ladies who were clearly heroes to her. 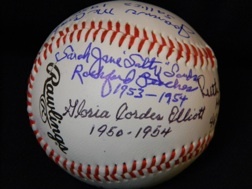 When you look at the pictures of the ball below, you will see that these ladies just didn’t sign their name and pass the ball, they each noted what teams they played with and when. 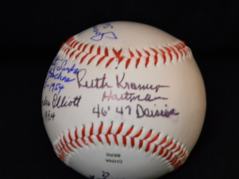 Ruth Kramer Hartman “The Queen of Baseballtown” made the comment to me, “These boys today, they just scribble on the ball. You can hardly read them.” It was obvious that they took this seriously and it meant something to them as well. I think one of the more telling moments was when the gentleman behind me in line saw Sara Jane “Salty” Sands “Baseball Hall of Fame” t-shirt. He asked her, “Oh so you’re in the women’s hall of fame.” She gave him the eye and said, “No, THE Hall of Fame, the one in COOPERSTOWN, New York.” I was so proud of her. 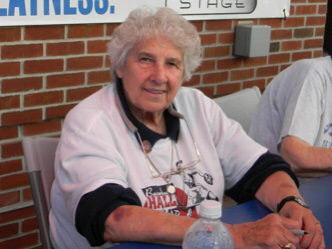 As I mentioned earlier, Ruth Kramer Hartman is a Queen of Baseballtown. 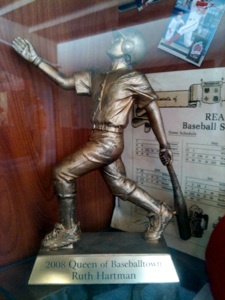 A King or Queen of Baseballtown is honored every year for their accomplishments and contributions to baseball/softball. Since 2003, only 8 people have been so honored…Ruth is the only woman, so far. My first contact with Ruth was several years ago. Since retiring from teaching, Ruth has gone on to raise sheep for competition. Ross’ cousin also raises sheep. So one cold January Ross and I went to the Pennsylvania Farm Show to check out the animals and see his cousin’s sheep. While we were standing there in the livestock barn, this lively lady walks by and says hello to Ross’ cousin and he introduced us and we spoke for a few minutes. After she left, Ross’ cousin told us who she was and that while they had been friends for years, she had only mentioned to him a few months earlier her storied past. 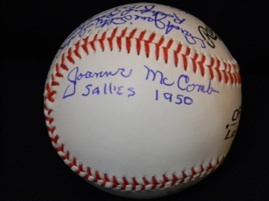 Ross’ cousin was involved in a charity auction and asked for just a signed baseball. She sent a number of items, not just a ball. Ross’ cousin was astounded by her kindness and generosity. Ruth Hartman sits at the Head of the table in Red. My first contact with Ruth was several years ago. Since retiring from teaching, Ruth has gone on to raise sheep for competition. Ross’ cousin also raises sheep. So one cold January, Ross and I went to the Pennsylvania Farm Show to check out the animals and see his cousin’s sheep. I suppose I should mention that there was a game in Reading last night as well. Austin Hyatt coming off a series of well-pitched games started for the Reading Phillies. Chuck LaMar, the Director of the Phillies Minor League system as sitting behind home plate. He was obviously there to check on Hyatt’s development. I was late getting to my seat as I had been getting my ball autographed. It wasn’t even the end of the first inning and Hyatt was out. He gave up 4 runs and was pulled after only two outs. Hyatt seemed unable to find the strike zone and his night was over early. It was a rough night in Baseballtown. Behind by 5 in only the first inning, it looked to be a long night. Brent Clevlen did get a homer but they did little else. In the 9th, they started to rally back…they fought to within one and with 2 outs and the bases loaded they brought in a new pitcher to pitch to Derrick Mitchell. Sunday night, Mitchell was hot, hitting a home run, a triple and a double, so it was apparent that the Baysox wanted to bring in a fresh arm. Alas, there was no joy in Baseballtown, the mighty Mitchell was struck out.